Celtic signed a 5 year deal with new kit supplier “New Balance” and they will be producing Celtic kits from 2015-16 seasons onwards and today Celtic has released both their home and away kits for 2015-16 season while the third kit has been leaked. This is the new traditional celtic home kit for 2015-16 season which is designed by new kit supplier New Balance the parent company of Warrior. 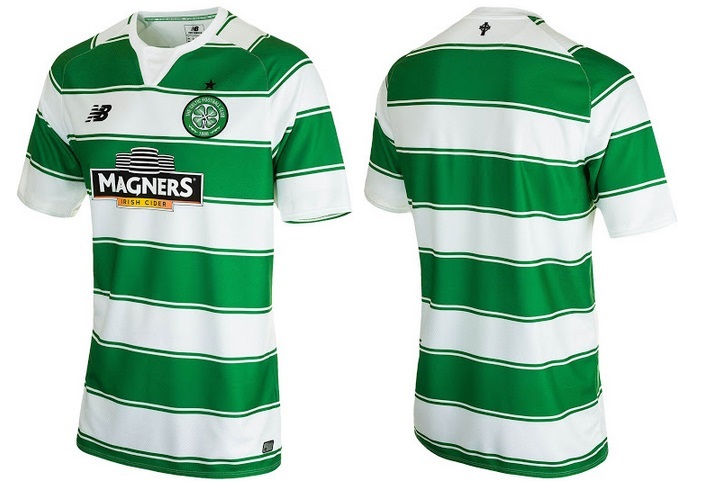 The home kit comes with a traditional celtic colours of Green/White with the rather large hoops design. The collar of the kit is small V-shapped in white colour while green hoops feature a thin green line as the outline on every horizontal stripe. The new balance logo comes in black colour while Celtic logo feature gree and white design. Home kit also feature hoops design on the sleeves and the back of the shirt as well. The sponsor logo of “Magners” kind of fit very well in contrast with the shirt colours and design. This is the new official away kit for Celtic which comes in green colour with white stripes and v-shaped colour. Kit also feature unique design at the end of the sleeve cuffs. We can also reveal the new third kit for Celtic which will be used in european away games next season. The third kit will be released officially at the end of july or early august and features a unique yellow colour design with black hoops.